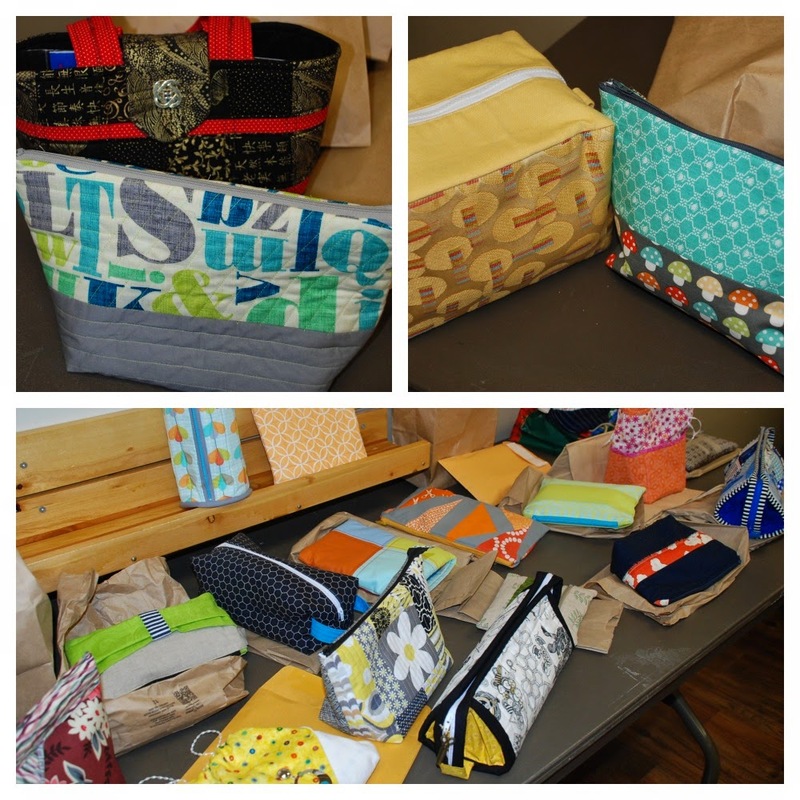 Our June meeting was a colourful success. We had lots of fun, because we always have fun, and we shared some awesome quilts. Kaleidoscope fabric bundle - Terry A. Satin Moon gift certificate - Diane R.
Congratulations to our winners, and thanks to our donors. May BOM - the Wonky Diamond, won by Tracy! 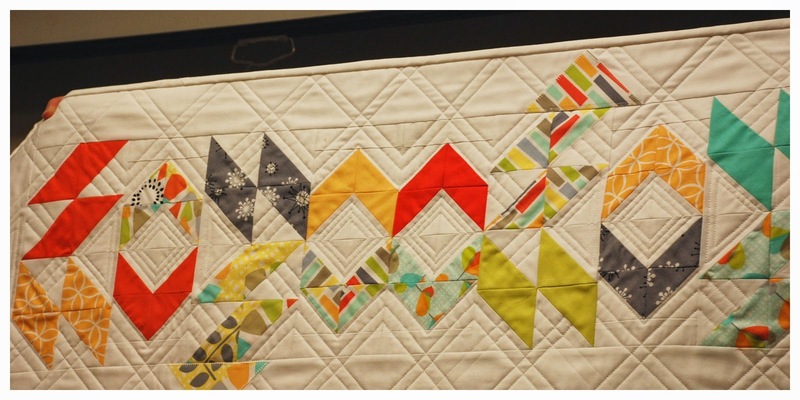 Gabrielle shared her progress with her Monochromatic X&+ block quilt. She added the two pieced borders, the solid black border as well as the vine and hexi/pentagon flowers. 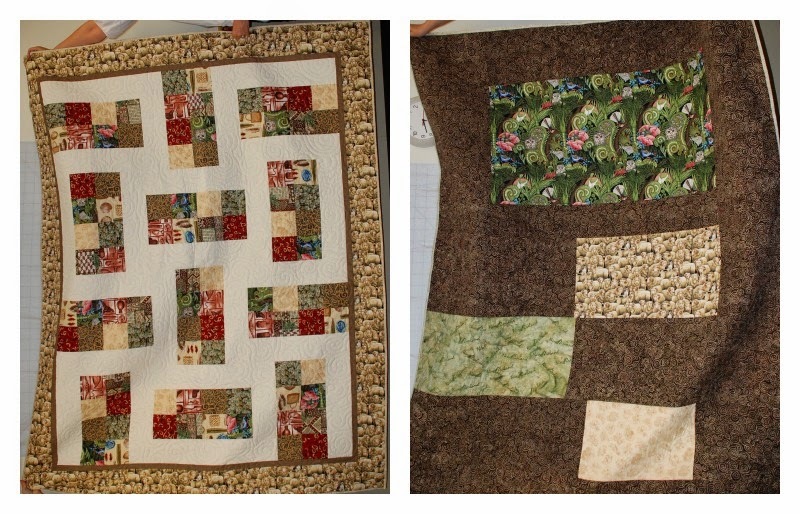 Barbara shared her owl quilt made in a challenge to use noren panels. The solid areas have beautifully done sashiko stitching. Marg showing the back of her table runner made with blocks she won from the BOM in March. 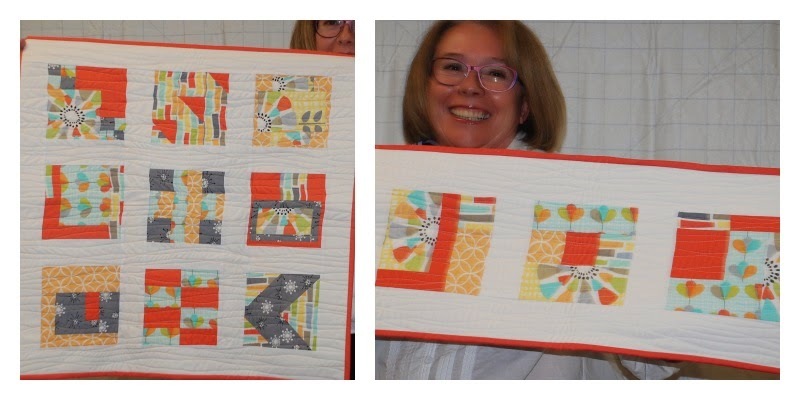 Marg is a new quilter and this is her first project! Guest Isa showed two blocks from a wedding quilt she is making for her daughter. Rhonda's Michael Miller project. Check out the great quilting. ...and a super cute Tula Pink cushion. Fran showing a quilt for Threshold Transition House. Fran and Jo-Anne showing a second quilt for Threshold. 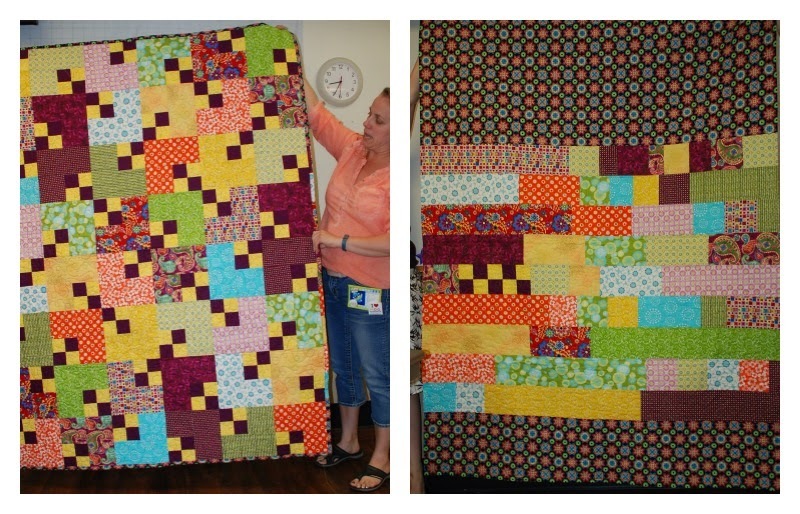 They quilted this one together, Jo-Anne doing some on her longarm and Fran on her domestic. Lisa's Michael Miller mug mat. Guest Bernadine with a terrific quilt for her daughter. It used up a lot of surplus fabric from an earlier quilt for her daughter. Guest Dawna with some spots. Dawna with another quilt, quilted in a great spiral. And the tote bag she brought them in! Janelle with her Michael Miller projects. Due to a cutting error one is smaller than intended but look at her smile! She looks pretty pleased regardless. 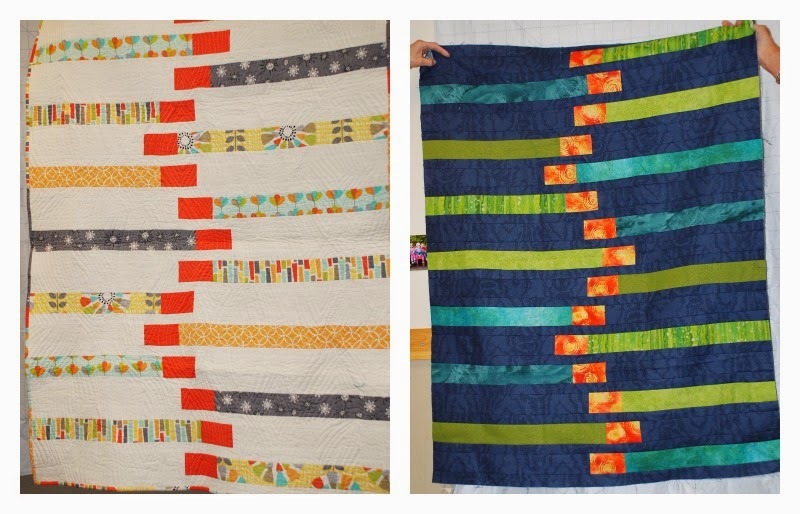 Janelle's NZ quilt, front (L) and back (R). The border on the front is sheep!! Rosalie with her double sided quilt. Stacie's quilt, and excellent use of scraps on the back. No leftovers for her! 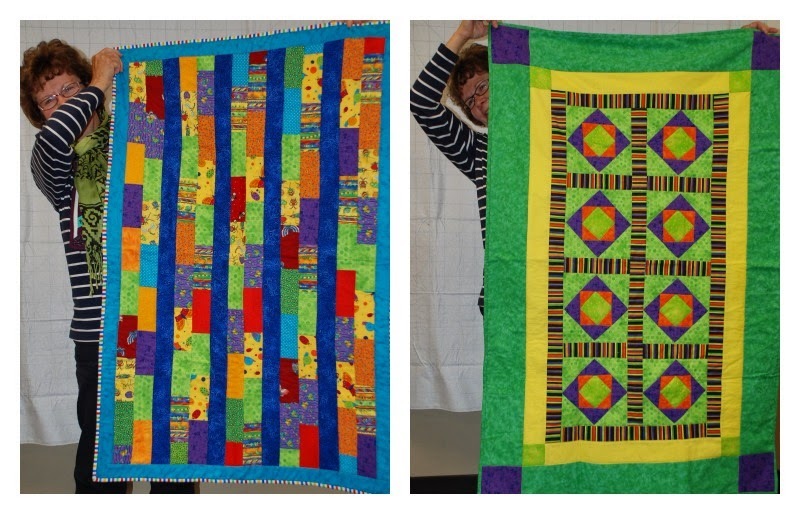 Ursula made the quilt on the left with her Michael Miller challenge fabrics and she likes this quilting the best of all the modern quilting she's done. And since she's such a great pattern designer, she made it again in stash fabrics. Thank you to everyone who shared their work with us. See you all at the July meeting – Pearkes Rec. Centre, Thursday July 17th at 7pm!